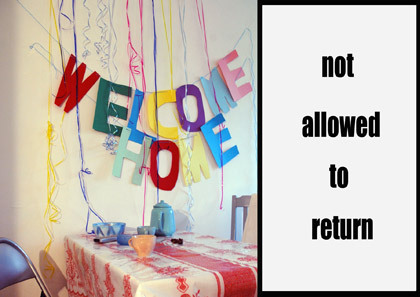 Welcome home is a context – responsive art project looking at notions of returning, non returning, and disappearance from a political, psychological and domestic perspectives. In 2006 Welcome Home focused in particular on the Palestinian Right to Return. Welcome home a gathering for those who are not allowed to return at, June 2006 part of Psi# 12 Performing Right festival/conference organised by Queen Mary's college Drama and English department and the Live Art Development Agency. Memorial Service Around 500 Palestinian villages and towns were destroyed, emptied out, or partly destroyed by Israeli forces between 1947-9. The memorial service will name 369 villages that were eradiated. Returning interaction an interaction where participants draw their teenage bedroom whilst wearing a blindfold. The interaction reappears in many of the projects. Necessary Journey Travel bursary to Israel/Palestine and video presentation at Tate modern. Review in Bidoun Arts and Culture From the Middle East, issue 07 spring/summer 2006. Territories of belongings was performed in Tou Scene art centre, Stavanger, Norway, November 2006. On the 10th of March 12.00 pm Welcome Home will be presented at the closure of the festival Performing Rights in Tanzquartier Vienna.